Posted on November 1, 2018 at 5:30 am. Today, the Student Services Staff will be presenting the final installment of its “Signs of Suicide” lesson— or S.O.S. This impactful presentation builds upon the “It’s Time to ACT” PSA that aired last month on WOLF-TV. The remaining group of 8th graders will receive this important information TODAY during Health and PE. Please see Mr. Caldwell or Ms. Boyers with any questions. Sister Circle will meet TODAY during ASP 1 in room 201. All young women are welcome — new members and old, friends and allies. So come out for a little Girl Talk — and a lot of fun activities! See Ms. Cameron with any questions. Curious about the world, its places, and peoples? Then come to the Geo Club — TODAY during ASP 1 in room WW___. See Mr. Miller with any questions. Want to make new friends, play some smooth music, and have a swingin’ time?! Then join the WMS Jazz Band Club! Meetings — also known as “Jam Sessions” — begin TODAY and will continue every THURSDAY during ASP 1 in room 225. All instruments are welcome — including guitar and bass players. Just sign-up on the activity board by the cafeteria, or go to the Jazz Club page on the WMS website for more information and to contact the band leader, Mr. Wilkin. The Best Buddies Club will be meeting this FRIDAY during WOLF TIME. Members and allies are invited to come make friends — and make a difference with some amazing kids. Just stop by room 108 TODAY to get a pass, and then we’ll see you there on Friday. See Ms. Rogers with any questions. Thanks, Buddy!! Up next, we’ve got a special opportunity for all you book-lovers out there. 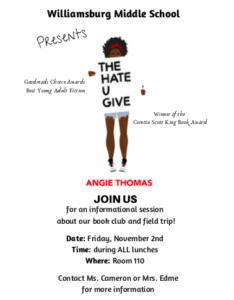 Ms. Cameron and Ms. Edme are launching an all new Williamsburg Book Club — and the first featured title will be “The Hate U Give” — winner of both the Goodreads Choice Award AND the Coretta Scott King Award. Interested “readers” are encouraged to attend an informational session this FRIDAY during all grade-level lunches in room 110. See Ms. Cameron or Ms. Edme with any questions.